Though they are buried deep underground, drainage pipes do not always lead an easy life. Ground movement and overloading can put them under great strain. Root ingress leads to punctures. Gardening and home improvement work can lead to cracks and fractures and as with most infrastructure, they become less effective with age. While all types of pipe are subject to these stresses, pitch fibre pipes, which were commonly installed between the 1950s and the 1970s as a cheap alternative to their clay counterparts, are particularly prone to breakage. These pipes have now reached the end of their design life and repair and replacement is necessary. For more information on our pitch fibre survey service call us on 0333 344 2937. Frequently this will involve digging around the area in order to get to the pipe. Unfortunately, this excavation period is one of the most disruptive parts of any drainage repair process. For many years, it was unavoidable. Frequently, the precise area of damage could not be located above ground, and extensive excavation would be needed to identify the source of the problem. In those instances where the damaged piping could be identified above ground, for example where there was clearly water present in the surrounding area, extensive excavation would still be required in order to access the pipe itself and carry out the necessary repair work. Yet, excavation poses several problems. First, it obviously greatly adds to the workload of the drainage engineer. The mismatch is obvious. Excavating a large area in order to access what may be a small damaged area is neither time nor cost effective. Indeed, sometimes excavation can mean the repair process takes weeks. Excavation is also inconvenient for customers and the public. We deal with a wide variety of clients, from high end fashion houses such as Chanel to private individuals, and we seek to keep excavation to a minimum across the board. Even the most timely and well executed excavation involves some element of disruption, and the consequences of this could be anything from customers temporarily being unable to access a business to a prized flowerbed being dug up. It is a customer service issue and the companies who have technology in place to avoid it will have the competitive edge – but how can it be avoided? Even with all the advances in medicine, it is difficult to imagine a day when there will be no need for surgeons to carry out invasive procedures on the patient in order to cut out cancers and repair damaged tissue. Similarly, it is unlikely that our sector will ever phase out excavation completely, but we have devised developed ways we can avoid it. Our business has developed no-dig techniques that allow us to carry out permanent and watertight localised repair of sewers and drains, analogous to the keyhole surgery used by the medical profession. These can be used on a wide variety of pipes, including pitch fibre. First, our operatives will clean the drain or sewer in order to ensure that the damaged area is not hidden by debris or sludge. Then we will put a CCTV camera down in order to clearly identify the broken section of drain. Once the area that must be repaired has been identified, we then use specially designed technology to mend the area. The two most common types of no-dig repairs are ‘cured in place piping’ (CIPP) lining repairs, in which a pre-shaped tube is used to cover and effectively replace the faulty area of pipework and patch repair, which as the name might suggest, involves putting a square or circular patch over the affected area. CIPP repairs or re-rounding is most appropriate for situations when a pitch fibre pipe has collapsed or become otherwise deformed. A special re-rounding tool is mechanically drawn through the pipe. As it moves, it expands deformed sections of the pipe back into their correct shape. We then use a CIPP polyester pipe liner which is inserted and, using water pressure or air, applied to the inside of the old pipe. This reinstates the original structure of the pipe, and provides a permanent repair. Where the affected area is more localised, patch repair work is more appropriate. Despite the impermanence that the word patch might suggest, far from being a temporary solution, these repair jobs have a projected lifespan of 50 years. The patch, which we prepare on site to match the size of the specific area in question, consists of a resin coated glass fibre mat which is made of specially prepared resins which can withstand the environment in a drain or sewer. Once the patch structure is finished, we wrap it around an inflatable pipe packer which is used to transport the patch from above ground to the affected area in the drain. Still using the CCTV cameras in order to check that everything is properly aligned, we then position the packer within the pipe in order to ensure that the patch adequately covers and repairs the broken section. Drainage repair isn’t just about mending damaged pipes, it’s about protecting the area around the infrastructure and minimising the disruption caused to the customer and public. No dig technology is one of the most useful tools in our armoury to ensure we can do this to the best of our abilities. 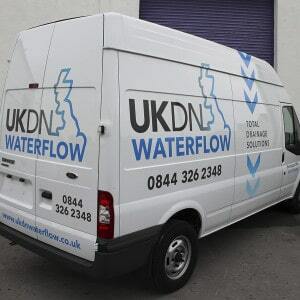 If you would like more information on how UKDN Waterflow (LG) Ltd can help, visit our page on pitch fibre survey and repairs.